The Clifton Industrial School for Boys (also known as the Bristol and Clifton Industrial School) was established in 1849 and occupied the former premises of the St Philip and St Jacob parish workhouse on Pennywell Lane (now Road), Bristol. On May 7th, 1859, the institution was certified as an Industrial School, allowing it to receive boys committed by magistrates to a period of detention. In 1866, after part of its site was required for the building of a cholera hospital, the School moved to larger premises at Thorns Building, Church Path Steps, Clifton Wood — the building had previously served as the Clifton parish workhouse. On October 23rd of that year, the establishment was re-certified with accommodation of 175 boys, aged 10 to 14 years at their time of admission. The then superintendent and matron, William and Elizabeth Hibbins, continued in their posts at the new location. In addition to their classroom lessons, the boys were employed in tailoring, shoemaking and brush-making, with basket making later added. The boys also assisted with the kitchen, laundry, and house work. In 1870, some additional rooms were rented in the locality for use as an infirmary if required. A School band was established. On June 7th, 1890, Mr and Mrs Frank Lewis Lord took over as superintendent and matron. Miss M.E. Howell took over as matron on August 8th, 1910. Other staff now included the Head schoolmaster, Mr J.E. Wilshaw; Assistant schoolmasters, Mr F.A. Ryall and Mr A.E. Crew; a drill and gymnastic instructor, tailor, shoemaker, carpenter and manual instructor, visiting bandmaster, yardmaster, cook, needlewoman, laundress, and dormitory matron. By 1896, the School had expanded into a new building known as Mardyke House which stood close by on Mardyke (now Hotwell Road) and provided a large workshop, dormitory, and school room. In the same year it was reported that the usual distribution of work amongst the boys was as follows: tailoring, 30; shoemaking, 18; binding and lining tool-baskets in tailor's shop, 18; carpenters (general repairs etc. ), 12; brushmakers (for one firm which supplied the materials), 69; patten-makers (mostly in the winter), 4; knitting and mending (younger boys under seamstress), 20; stokers, 2; house, laundry, &c., 27. Boys were passed on from housework to a trade within 12 months, unless in training as a page boy. The brass and reed band now comprised 28 performers under the charge of the second schoolmaster. The School had no playing field, but the boys were taken out to the Durdham Downs twice a week for football and cricket. The School's swimming bath was large enough for the boys to learn in, and about 80 a year succeed in doing so. Musical drill with dumb-bells and wands was carried out daily. There were generally four outings in the course of the summer, and occasional visits were made to local entertainments, A magic lantern was used frequently in the winter, and entertainments were got up by the boys, and also by friends of the School. There was a library of 400 books, which were largely read in the winter. Indoor games are also supplied. Boys of good conduct were allowed leave of up to 8 days to visit their homes, if suitable, twice a year. The School's two sites are shown on the 1902 map below. 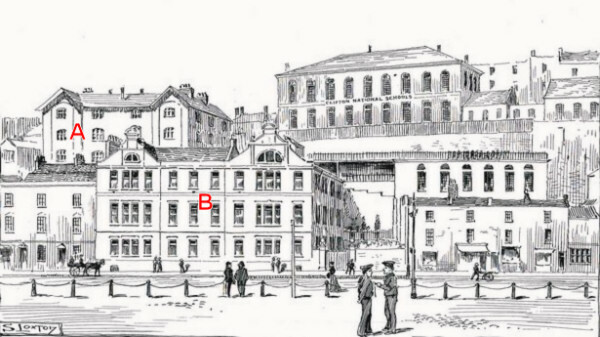 The Church Path Steps building is marked 'A' and the Mardyke building 'B'. Clifton Industrial School for Boys site, c.1902. Clifton Industrial School for Boys from Mardyke. A mark system was introduced into the School where good conduct earned a monetary reward, part of which was banked and the rest being allowed to be spent on a treat. Leave and other privileges were also dependent on the mark system. The School eventually operated entirely in Mardyke House and became known as Mardyke House School. Due to falling numbers, the School was formally closed on August 8th, 1924. The remaining inmates joined the National Nautical School at Portishead. The Clifton Wood School buildings were destroyed during the Second World War. Bristol Record Office, 'B' Bond Warehouse, Smeaton Road, Bristol, BS1 6XN. Some records covering both Clifton and Portishead. Holdings include Annual Reports (1847-1898); Registers of Boys (1872-1931); Discharge and Licence Records (1918-1964); Staff salaries (1915-25); Staff wages (1919-1924).